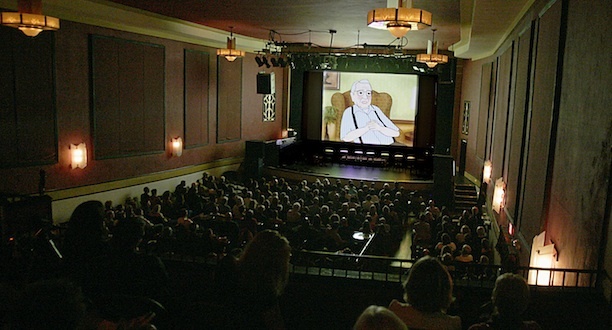 The 4th Annual Film Fest Petaluma is Saturday May 5, 2012 and will showcase three diverse programs of shorts by international award-winning filmmakers and local students at Petaluma’s historic Mystic Theatre, 23 Petaluma Blvd. North, in downtown Petaluma. The day long festival is the brainchild of festival director, Mike Traina, who runs the popular Petaluma Cinema Series program at SRJC’s Petaluma campus. This year’s programming features a mix of animated, live action and short films, as well as comedy and drama, with more than a dozen filmmakers from five countries in attendance to participate in post-film discussions. Film programs, featuring 8 to 10 shorts each, are at 2:30 and 7:30 p.m., with an edgier program at midnight. The program also includes Sonoma County student filmmakers too—Fiona Becker (The Pulsera Project screens in the program at 2:30 p.m.), Amy West and Jacob Bellochio (Mud screens in the 7:30 p.m. program) and NickNuebel (Ancient Alien Ice Road Trucker Wars screens in the midnight show. Click here for a full schedule. Highlights include this year’s Oscar winner for Best Animated Short, The Fantastic Flying Books of Mr. Morris Lessmore (William Joyce and Brandon Oldenburg, USA 16 minutes) Inspired in equal measures, by Hurricane Katrina, Buster Keaton, The Wizard of Oz, and a love for books, Morris Lessmore is a story of people who devote their lives to books and books who return the favor. The film is a poignant, humorous allegory about the curative powers of story that uses a variety of techniques (miniatures, computer animation, 2D animation) and presents a hybrid style of animation that harkens back to silent films and M-G-M Technicolor musicals. Screens in 2:30 p.m. program.